After falling into a 6-0 hole midway through the first half, the Albemarle girls’ lacrosse team rallied to make things more interesting against rival Monticello on Thursday night. 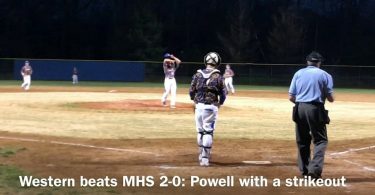 The Patriots shot better than 50 percent for the final 10 minutes of the opening period, and refused to let MHS cruise, to, at one time, appeared an easy win. But for every Albemarle run and spark of life on the home sideline, Monticello’s Caleigh Smith was flip the momentum. Smith tallied six goals and two assists while making a bevy of key plays in the Mustangs’ 16-13 triumph on the road. One of the quickest player on the field for either team, Smith made sure that any excitement on the Albemarle bench was short-lived. Albemarle (1-5) finally got on the board with back-to-back goals late in the first half, before Smith scooted right down main street for her third score of the evening. Her night was far from over. The Patriots finally pulled to within three midway through the second half, before Smith countered with a fast break goal less than two minutes later. Albemarle senior Anna Murray later trimmed the Monticello lead to just two with 8:05 remaining in regulation before Smith went to work once again. Once the Mustangs regained possession, Smith positioned herself behind the Albemarle cage, with everyone in a white jersey wondering what she was going to do next. With all eyes locked-in on number-three, Smith found a cutting Alison Swartout, and the freshman cashed in to give her team a 15-12 lead. Smith later tallied her sixth goal of the contest to complete the scoring for Monticello. Along with Smith’s big night, Swartout turned in six points, (four goals and two assists), while fellow freshman Taylar Hackney added a pair of goals and two assists. 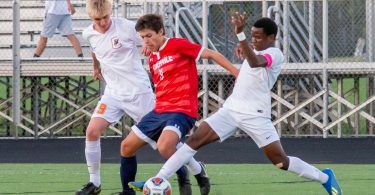 Both teams scored in bunches throughout Thursday’s contest, including a five-goals-in-100-seconds spurt towards the end of the first half, but the Mustangs stood tall on defense when it mattered the most. Monticello (5-1) kept the Patriots off the scoreboard entirely for the first 16 minutes-plus of the first half, which allowed the visitors to build what would be an insurmountable advantage. Then, once the Patriots got going in the second period, MHS packed it in tight at the cage, and allowed just two scores in the final 10:53 of regulation. Freshman Leigh Young led the offensive charge for AHS, netting all four of her goals in the second half. Young traded goals with Monticello’s Josie Mallory midway through the second half, to keep the Patriots within striking distance. After creeping to within four goals at 13-9, Young then hit Kelsey Meyers for the second of her three goals on the night to cut the lead to just three. Curry’s big-time goal with 8:05 remaining in regulation pulled the Pats to within two, but the home team couldn’t close the gap any further. Albemarle played a man-down beginning at the 16:00 mark of the second half, and then went two players down four minutes later. The numbers disadvantage could have meant lights out for Albemarle, but head coach Brittany McElheny was proud of the way that her team stood tall in the face of adversity.